Vessels and sculptures made for the window at The Guild at 51. Since working in the United States in 2013 we have for the first time been developing carved hollow vessels, each made from a single piece of timber, sawn, hollowed out and re-assembled. This new group of vessels are on a much larger scale, and more fully three dimensional. 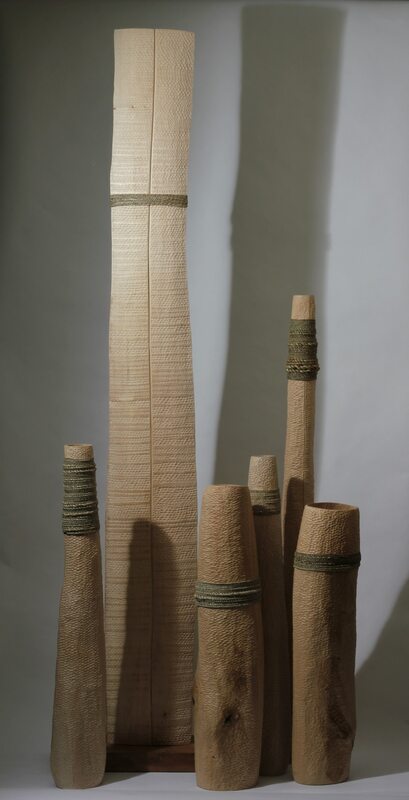 Forms are more organic, with movement exploiting the individual knots, shakes, and other ‘defects’ of the wood. Surface textures use fine repeated gouge cuts to bring light and shade to the grain of the wood and overall form. Again unusually for us, these vessels are not limed white or scorched black, they leave the wood’s original colour variations of summer and winter wood, and the different directions of growth within the trunk. All this gives the pieces a more strongly physical presence, closer to the trees from which they came. The larger flat forms take the same approach on a more sculptural scale. Bindings are in cord made by us from salt rush, a traditional material, twisting the hollow blades together by hand into a continuous strand. Each length is made for the specific vessel, using the variation in size and thickness to give an expressive horizontal contrasting with the vertical forms. Malcolm Martin is giving a talk at SIT Select Showcase in Cheltenham in October. This entry was posted in categories; Guest Exhibitor. ← The passing of a quiet and gracious lady.